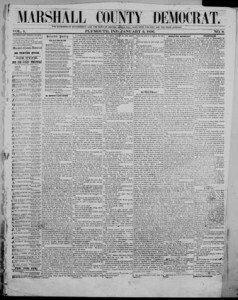 Issued as the Marshall County Democrat from 1855-1859, digitized issues are available through Hoosier State Chronicles. The Marshall County Democrat debuted on November 15, 1855, in Plymouth, an agricultural community in north-central Indiana. The paper originated not long after the Kansas-Nebraska Act divided the Democratic Party. While the Marshall County Democrat declared, “Slavery is wrong, either North or South of the Missouri Compromise line,” it also endorsed popular sovereignty stating, “All territory is free until it becomes a State, and then the people alone can control the institutions.” Thomas McDonald co-founded the paper, and he and his sons, Platt and Daniel, and grandsons, John and Louis, would intermittently own the Democrat over the next 47 years. 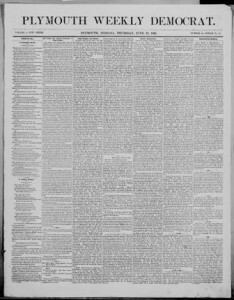 Issued as the Plymouth Weekly Democrat from 1860-1869, click to access these issues from Hoosier State Chronicles. During the Civil War, Daniel E. VanValkenburgh acquired the newspaper, which the Union Army suppressed in May 1863. Early that month, General Ambrose Burnside issued General Orders No. 38 which permitted military commissions to try any private citizen who expressed opposition to the Lincoln administration or sympathy for the Southern rebels. VanValkenburgh editorialized on what he viewed as Lincoln’s abuses of power, and lamented, “It may be that our liberties are ‘clean gone forever.’” The last straw was VanValkenburgh’s criticism of Burnside’s lieutenant, General Milo S. Hascall. The Democrat wrote, “Brig. Gen. Hascall is a donkey, an unmitigated, unqualified donkey, and his bray is long, loud and harmless.” A few days later, Union soldiers arrested VanValkenburgh and brought him before General Burnside in Cincinnati to answer charges of treason. Burnside ultimately released VanValkenburgh but cautioned him to be more careful of his criticisms in the future. After several changes in ownership, the McDonalds reacquired interest in the Democrat in 1869. By 1877, Daniel McDonald had become complete owner, and with the exception of an interruption in 1879-81, he owned and edited the paper until 1902. By 1894, the Democrat had expanded to eight pages. It reached its peak circulation around that time with a reported 1,650 copies. Clay W. Metsker, the owner of the Marshall County Independent, acquired the Democrat in March 1902. He merged the two publications but continued issuing them under separate titles as daily and weekly editions respectively until 1909 when the Democrat replaced the Independent as the daily edition. Metsker sold out to Roland B. Metsker and Heyward P. Gibson in March 1931. The new owners renamed the paper the Plymouth Daily News. They also retained the Democrat title for the weekly edition until discontinuing it in January 1941. Miller, John W. Indiana Newspaper Bibliography. Indianapolis: Indiana Historical Society, 1982. Towne, Stephen E. “Killing the Serpent Speedily: Governor Morton, General Hascall, and the Suppression of the Democratic Press in Indiana in 1863.” Civil War History 51 (2006): 41-65. N. W. Ayer & Son’s American Newspaper Annual & Directory. Philadelphia: N. W. Ayer & Son, various years. Geo. P. Rowell & Co’s American Newspaper Directory. New York: Geo. P. Rowell & Co., various years.